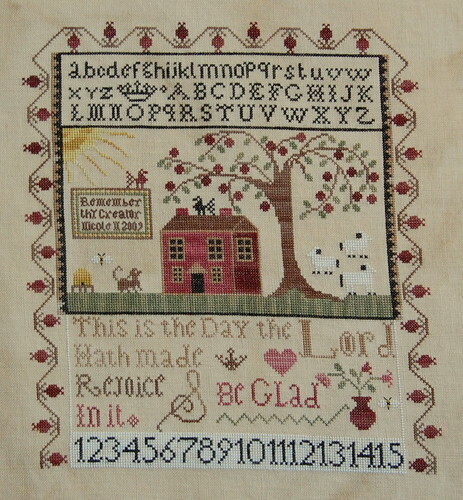 Nicole's Needlework: This is the Day - Finished?? Hands to Work (Tracy Riffle) "This is the Day"
After I finished TiTD - I decided to start something new. 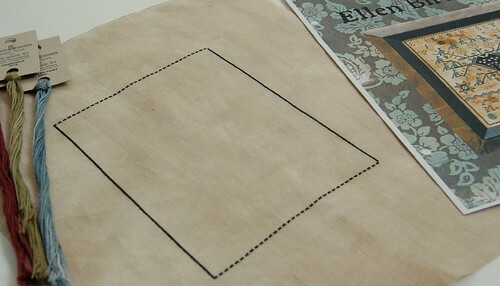 I decided to start The Goode Huswife's "Ellen Birdseye" using Melissa's conversion. I found a pretty piece of 36 ct. Vintage Navy Bean in my stash. I'm stitching it one over two. Nicole - This is the Day looks wonderful. Congrats on a great finish. You know, you could always coffee or tea dye a skein of white floss and then go back in and do the fill in if you want. But I think that either way, you piece looks fantastic. And I love your choice for your next project. I've got Ellen at the top of my short list - but I'm deciding on whose conversion to use! Can't wait to see how yours progresses! This is the Day looks fantastic. I think the top piece looks wonderful as is. Your finish is wonderful I don't think it looks "unfinished" at all. Sometimes I think a filled in block can take your eye away from the overall piece. You stitched it so fast too! Love the new start. Have fun stitching it! It's perfect Nicole! And I am completely in love! I absolutely must have this for myself!!! I may have to try to backorder that magazine! WOO! Congrats on finishing up TitD! I thought about doing the same, leaving out the background. I think it looks good both ways. Can't wait to see how your Ellen looks as you work on her. Enjoy your weekend! It is so beautiful! I love how the colors look together. I like it just the way you have it. I was thinking of not filling in either! Looks beautiful! Nicole, your This is the Day looks gorgeous! I LOVE all the changes you have made and I think it does not look unfinished at all. I absolutely prefer the top alphabet not filled with all that bright white, I think you have given it a more harmonious and antiqued touch. Actually, if you do not mind, I would stitch it copying all your changes...! THIS IS THE DAY IS BEAUTIFUL LOVE THE COLORS! Ok, I think this is totally beautiful and stunning! Can you share your secret of how to stitch so fast????? Wow! Nicole that is beautiful!! Will be lovely on your wall of samplers. 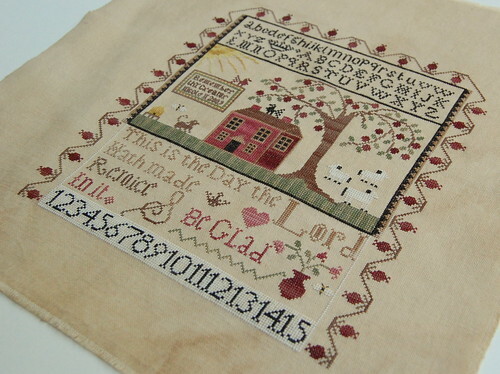 At this rate you will have an entire of collection of samplers stitched by the end of this year! Nicole, TiTD is gorgeous. I think my favorite part is how you got the grass to look like the lawn. I love the vertical lines in it. I've been searching for ways to take better photos. Do you take photos through a light box or something because your photos always come out with perfectly even lighting? It's so professional looking. I love how that peice turned out. it looks wonderful. Can you please tell me how many hours you spend a day stitching. it seems as if you never sleep LOL everytime I check into your blog you have another lovey design finished and another great one started. This is the Day looks perfect as it is Nicole - another lovely finish! Oh, so pretty! TiTD looks finished to me. Ellen is gonna be a very fun stitch. The beach? Did you say the beach? I wanna go! It looks wonderful and I don´t think it needs the top background filled in... it looks good with or without (and if I ever get around to stitching it, I will leave it off too). This is the day looks absolutely beautiful!! :) It's such a joy to look at. And your pictures are so crisp and clean, I absolutely love them. Nicole, this is a wonderful finish, it's such a beautiful design. Your new start is a great design and you have chosen a great coloured fabric. I like your changes - congrats on a fabulous finish! Beautiful, Nicole! Congrats on a great finish. Nicole, your finish is absolutely gorgeous. I just love it, and it's perfect as is! This is the Day turned out just fantastic! You done absolutely gorgeous stitching on it! Beautiful piece! Congrats on the finish! Looking forward to watching your progress on the new one! Wow, congratulations on the finish! Beautiful as always but you really should slow down and let the rest of us catch up with you! LOL! I can't wait to see you work on your new start! Very pretty! I love TitD. I decided to use WDW fawn to fill in I hope I like it :-). Can't wait to see your Ellen Birdseye progress. Since I am following my new "whatever feels good" rotation I may have to kit her up too, LOL. This is the Day turned out really well! Looking forward to your next project. Perfect as it is! less is best! This is the Day is just beautiful as it is!! I wouldn't change a thing. I would never try to dye a project after it is stitched. I accidently spilled water on a coffee dyed project and the coffee ran on the threads and it ruined the color of the threads so I wouldn't advise doing that. The colors in this are beautiful!! I love your finish!!! I would call it finished!! It looks wonderful, and you don't need to change a thing! Have fun on your new project! Hi Nicole, I love your "This Is The Day". It is absolutely wonderful! I'm still in search of the magazine so that I can stitch it also. You do such wonderful work!! It looks wonderful! Congrats with such a beautiful finishing! It looks wonderful, also without the white background. Congratulations! Gorgeous! I just love these colors!!! Congrats on the finish and the new start.